Michelin's A2 Airstop Tube is ideal for training and recreational riding. Available in size 700c x 25/32mm (25/32-622 ISO), with a smooth Presta valve stem. This tube will also work well with 27" x 1 1/4" tires. 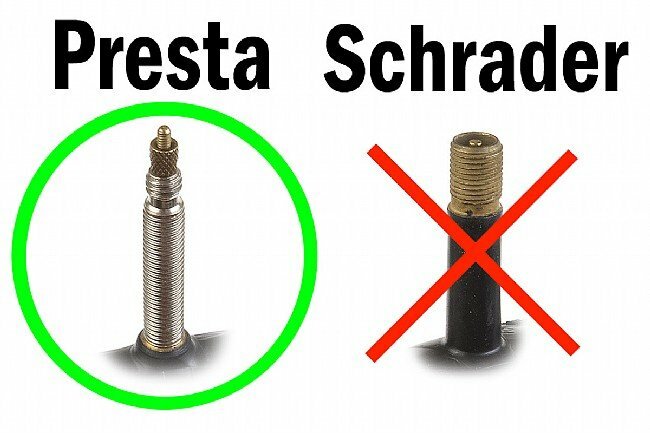 Note: If your rims are designed for Schrader valves (like on a car tire), you can use "Presta Stem Savers"—metal sleeves that fit over Presta valves to provide a snug fit in Schrader-sized valve holes. I only use smooth stem tubes on my bikes as they do not tear up the o-ring seal on my pump. I still have not figured out why the unneeded threads were ever put on stems in the first place. Smooth stem tubes in this size are almost impossible to find. However they are available here at a decent price. As long as they continue to be available here I'll keep coming back. These are good quality tubes too. I have been using them for many years and have never had a flat due to a fault of the tube. Not a bad tube for the price. I have ridden Ive 1000 miles and no problems. It holds air! Very reliable for everyday use . We use these tubes in a bike share fleet . They hold air well and do not flat as often as other brands that we have tried . I can never remember ever having a split at the seam which is note worthy . Install new tubes and forget about them. I have been using Michelin A2 AirStop tubes on my Schwalbe Marathon Supreme and Marathon Plus on my touring city bike for the past 8 years. I have had only 2 punctures in that time. The first puncture was on my first ride with this tube tire combination because the shop mechanic who installed them had left a piece of wire inside the tire. My first ride was a 200k randonneuring ride and the wire inside the tire wore a hole in the tube after about 75 miles of riding. I replaced that tube with another AirStop and ended up getting 8,000 on that set of tires and tubes without any more flats. The second puncture was on my second set of tires and happened because I ran over a horseshoe cleat and 2 nails punctured my front tire. Even though the nails went all the way through the Schwalbe tire into the tube, I was still able to ride my bike 2 miles home and never even had to add air to the tube on the way. I originally discovered these tubes not because of their resilience, but because of their smooth valve stem. I have been riding tubes with Presta stems since the early 1970s and worn out several pump head gaskets on threaded stems. 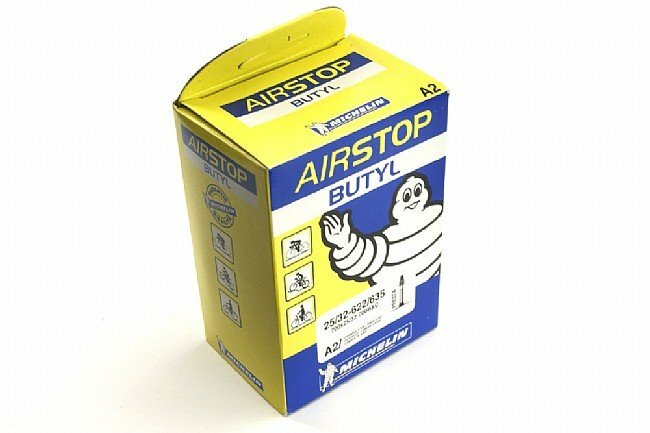 I switched to Michelin AirComp (700x23c) on all of my road bikes and Michelin AirStop (700x32c) on all of my city and touring bikes. Those are the only tubes I will buy. I run tires between 25 and 32mm, and these tubes are my go-to for all of them. My rims go up to 30mm depth, and I think that up to 4-5 more mm would still work fine. Not much to report, as I've had zero problems with these tubes and haven't gotten any flats lately. Holds air better than the competition. Reasonably puncture resistant. Only knock is the cost compared to others (Kenda, et. al). A good tube but . . .
Bought 4, 3 have worked well with no problems. One of them ripped a hole too big to patch when it was unfolded. Disappointed in rubber quality and spot thinness that resulted in little tube aneurisms, one of which ruptured, flatting me on dirtgravel. I've used Airstop 700x18/23 tubes for years. They seem to have a good balance between weight and durability and I like the threadless stem since it doesn't tear up the pump fitting. I recently switched to 700x25 tires and moved up to the 700x25/32 Airstop tubes. They seem bulky relative to the tire size and tube changes don't go as smoothly. I think the weight to durability ratio is probably not as favorable, but I can't say that's translated to any noticeable difference riding. I do find the 700x25 tires incredibly comfortable so will not be going back, but might try other tubes if something catches my eye. Great tubes for the bike. They aren't too heavy but provide a good overall feel in the tires. I buy these mostly because I like that Michelin A2 Airstop Tubes have the smooth valve option instead of the threaded valve. These tubes generally resist punctures well but no tube is puncture proof or snake bite proof. About 1/4 of the ones I've bought are defective - weaknesses in the wall cause some areas to balloon out. The others work just fine. I used these tubes for years, then I quit biking for awhile. When I came back to it I tried some cheaper tubes to save a little money...big mistake. Of the 20 I bought, 5 had valve issues imediately and the rest made it one or two rides at best. My ride takes me through an industrial area (most of the way), but still. I went back to the A2s and I'm very happy with the quality and durability. A good, decent product used for its intended purpose. I bought it for its smooth presta valve and works just fine for an easier on/off during inflation. Great tubes. You really do end up filling up less. I've been useing this tube for many years and have yet to find a negative side.They are easy to mount,hold pressure well,and not alot of flats.A great product.I dont use any other. These are for a commuter with normal size tires and rims. I like the unthreaded stem that should help with pump seal longevity. Smooth brass valve stem is easy on pump heads.